Picture this: You are at a workshop. The Facilitator announces: “Self-Introductions!” She gives everyone 30 seconds. She’d like to start with… don’t freak out… you. Yes, you. Your heart races. Your mind goes blank! Your self-introduction creates a first impression. The trouble with first impressions is they last. And lasting negative impressions require sooo much effort to change to the positive. Why not just learn how to introduce yourself well and begin with a bang, not a whimper? 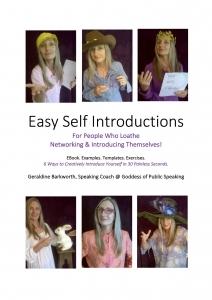 Easy Self Introductions Ebook is written by Australian Speaking Coach Geraldine Barkworth, based on hours of work with clients who loathed introducing themselves and now consider themselves a Self-Intro Superstar! The EBook contains 20 pages of examples, templates and exercises. At $25, it's low cost, highly transportable and a fast pdf download, available now. 20 pages, low cost, fast download, transportable pdf file, available now. There are so many ways to self-introductions, don’t limit yourself to 1, 6 or 600. I invite you to use this short Ebook, “Easy Self Introductions. For People Who Loathe Networking & Introducing Themselves. 6 Ways to Creatively Introduce Yourself in 30 Painless Seconds" as a springboard to your own ideas. Self-introductions appear to be about you. But self-introductions are really about your listeners. Use creativity, honesty and brevity to explain who you are and why they need you. Never freak out again!